Don't let space or noise restrictions stop you from recording your guitar at home. There are loads of great software amp modellers available, most notably Native Instruments' Guitar Rig and IK Multimedia's AmpliTube. In fact, many DAWs come loaded with great amp modelling onboard for free. Whichever one you're using, the concept is the same - here's how to get the most out of modelling. For a more advanced tutorial on recording six-strings, take a look at our guide to recording studio-quality electric guitar tracks at home. Once you've loaded your DAW, create a new audio track. Amp modelling is then applied as a plugin. Think of a plugin as a program within a program: your DAW acts as a 'host' to the amp modelling software, and all of your settings and signal chains are saved into the song, so it'll remain exactly as you leave it when you next open your song. You'll need to use it as an 'insert' effect, rather than a send, otherwise you'll hear a blend of your guitar's dry, clean signal along with the effected sound when playing. One benefit of amp modelling is that it is inserted on the output of your DAW's signal chain. This means that what is actually being recorded is your dry guitar sound, so if you decide to change the EQ, gain settings or even the type of amp after you've recorded, you're free to do so! The last point is indeed one of the greatest virtues of amp modelling software, but at some point you will have to make a decision on your tone in order to finish your song. Learn how to recognise when you're finished, then move on to the next part. 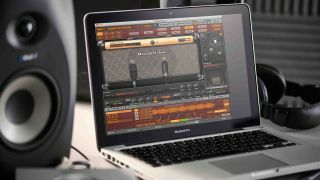 It's easy to fall into preconceptions when using an amp modeller - big rock tune? Use a stack! But it's also a great idea to try out some unexpected models, too. Flick through some different amp and speaker types and see how they fit in your mix and you might just find the perfect match where you least expect it. In the real world, every time we want to add a pedal, amp or speaker to our rig, we're plagued by switching boxes, cables, and noise. As well as this, you'll need the space, and resources to get your hands on such gear. But this is virtual, baby! Rigging up two amps at once is easy, and you won't find a ground hum in earshot. This is also true of creating crazy effects patches. Want three fuzzes, a wah, and four delays? The only limitation is your imagination and processing power, so get stuck in! Many amp modellers give you control over the type of virtual microphone that's used on your virtual cab, and you can usually change its position, too. Play around with blending different virtual mic types and placements together, and you can often scratch the tonal itch that EQ and gain settings can't reach. Okay, we know this bit is predominantly about software amp modellers, but many multi-effects units and amps can act as an audio interface, with onscreen control over your amp. This will take some of the strain off your computer, and allow you to silently record the settings you know and love without any noise from microphones.